Several years ago, Dr. Dana Clark, a friend of mine who teaches in the business school at Appalachian State University penned an article warning communities bent on building mega-facilities that the initial cost will be just a fraction of the overall cost. Partially, this is because construction since WWII, according to the Urban Land Institute, has been designed only to last 20 to 30 years. This may be why the DBAP has just undergone another renovation that probably exceeds its original construction cost twenty years ago. 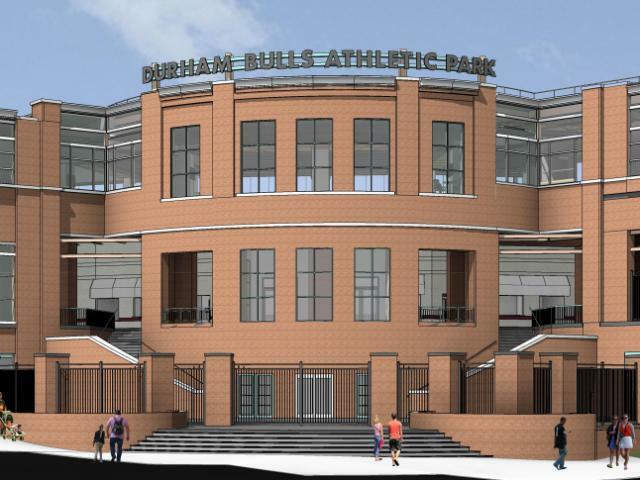 This time though, the City of Durham is on the hook for no more than $12 million with the owners of the Durham Bulls picking up about $8 million and agreeing to a lease keeping the storied team until at least 2033. I remember glares of awkwardness I got from some when I corrected the misimpression left with Minor League Baseball officials by other economic developers during a tour many years ago that the acclaimed ballpark was a privately-held initiative. At least now it could be argued that a fraction will be, as well as responsibility for operation and revenue-sharing, a win-win for the City. This renovation was more than a face lift. It included a new video board with more than 3.8 million LEDs, 8,000 linear feet of drain pipe under the field, 14 dump trucks of infield clay, 164 clusters of lights, 189 dump trucks of sand on which to lay a new field and all new seats with higher backs. A new club level (air-conditioned restaurant/bar/event space) will be open to skybox owners, patrons and to season ticket holders who purchase a club membership for an additional fee, well worth it during hot, humid summer nights. It is also available to groups for $45 per person. The opening pitch this week to the new season will use one of 8,568 baseballs the Bulls will go through this season, about eight to ten dozen every home game. The renovations were accelerated rather than phased because Durham hosts the Triple A baseball All-Star Game this year including five days of events. Initial construction is only the beginning when it comes to cultural infrastructure, including facilities. DBAP, it can be argued, spurred redevelopment of the historic Old Bull and Lucky Strike factories as well as construction of three new buildings. Here again, the portion for local government increased to around $100 million. In time, the local governments here will recoup some of the investment in increased property taxes, minus the impact of tenants dislocated from other parts of Durham. As a baseball fan, I enjoyed watching the team in the now restored historic DAP north of city center, but given the alternative of losing the team, I think building the new ballpark just south of city center was our only option. Built to look historic, the DBAP fits seamlessly with the historic built-scape part of Durham’s sense of place and has been leveraged through relentless community destination marketing into visitor-centric economic and cultural development that has repaid its original cost. I’m not sure taxpayers would go along with cultural facilities like this if they knew the eventual lifetime costs, especially in destinations where it seems someone went shopping for culture one day and bought one of everything. Cultural facilities, if tied to the indigenous distinctiveness of a community, are as important as any other type of infrastructure. But as a friend of mine explained at the meeting of a state business lobby held in Durham last week, all too often the private sector refuses now to pay for public infrastructure because it sees it as a transfer rather than as the economic lifeblood it is. At least the owners of the Durham Bulls seem to view it as a partnership.